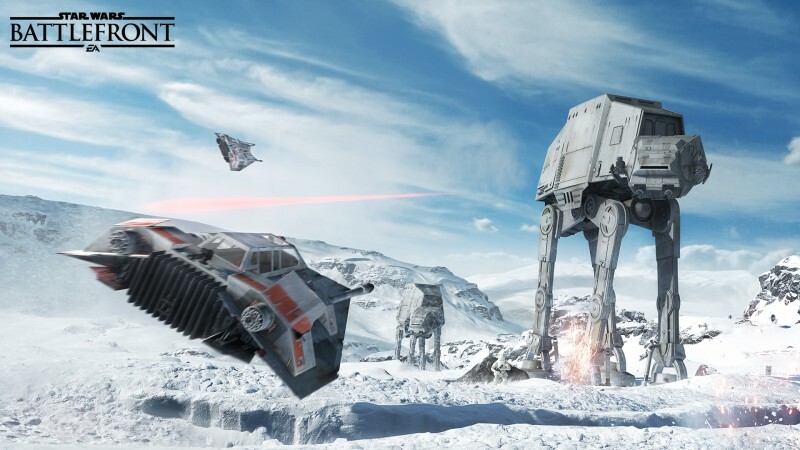 Electronic Arts' walled-off booth at Star Wars Celebration contains one of the show's best-kept secrets, a lengthy video of the forthcoming Star Wars: Battlefront video game. The booth interior, which we were not allowed to take photos of, is designed to look like a Rebel Alliance briefing room, complete with a command terminal in the middle, and tiered seating for the pilots, soldiers, and less-important game journalists like myself. The setting screamed classic trilogy, and was the perfect fit for the demo DICE had on hand: a gameplay slice recreating the Battle of Endor from the film, Star Wars: Return of the Jedi. All is quiet on Endor's moon, but the Rebel Alliance troops patrolling the forest floor don't anticipate it will remain this way for long. They are alert, fingers on triggers, heads swiveling frantically, waiting for the Galactic Empire to emerge from the thick forest foliage. The trees stretch high into the air, their canopy blocking out most of the mid-day sunlight, and knee-high plants give the nerves no reprieve as they sway gently in the breeze. The demo is seen through the eyes of one of the Rebel's foot soldiers. He's human, decked out in green attire, and his load out consists of a laser rifle, thermal detonators, and a spherical energy shield that appears to be similar in design to those used by the Trade Federation Droidekas. The soldier studies his surroundings intimately, checking most vectors – high and low – for Imperial movement. An explosion deeper in the forest puts him and his crew in motion. One of his squad mates yells "speeders," which are on top of them as soon as the announcement is made. The speeders roar through the plants and off into the distance in a heartbeat. From this moment on, the action doesn't slow. Shots are fired through the treeline toward the rebel troopers, and a squadron of stormtroopers pour out of the woods. Our trooper opens fire, downing several stormtroopers on a hillside. Each kill brings up "killstreak" experience points on the HUD, immediately connecting this game to DICE's other juggernaut franchise, Battlefield. The laser blast from the Rebel trooper's rifle packs a punch, delivering a brief puff of smoke on the target's torso before the body collapses to the ground. Laser fire rips over head with the familiar flash seen in the original trilogy movies. The Rebel Alliance is making quick work of the stormtrooper onslaught, and is steadily moving forward across Endor's gorgeously realized terrain. The density of the trees and the sloping landscape they occupy make sight lines difficult, and add intensity to the conflict. The Imperial attacks appear to be uncoordinated, with stormtroopers emerging from the brush with no support, and others in small squadrons of four to five soldiers. The Rebel Alliance, on the other hand, is fully coordinated, working together as a team (which all appear to be human-controlled in the demo). One rebel soldier verbally alerts the squad of the first legitimate threat – an AT-ST lumbering awkwardly through the woods. The AT-ST is heavily armored, and our rebel trooper's laser fire doesn't appear to faze it (or the red health meter that appears below its name). The soldier audio is generated dynamically in game, and is not the chatter of the players. The rebels spread out and open fire on the heavy unit, but again, there isn't much their standard weapons can do. Just when it seems like retreat or a thermal detonator toss may be in order, the AT-ST explodes, its metal frame soaring through the forest, flames eating away at what's left of the still standing legs. Ewoks can be heard celebrating, but they don't make an appearance in the demo. A rebel trooper landed a rocket blast on the AT-ST and it appears it only takes one hit to down it. The Ewok's elaborate village is seen briefly, high up by the tree canopy. An Imperial trooper uses one of the Ewok's bridges as a vantage point, but our trooper, who is now wielding a sniper rifle, takes him out with one nicely placed shot. The rifle spits out a green spherical shot. The rebels push the fight further into the forest, where our soldier locates a rocket launcher of his own near a log. The rocket launcher is represented as a blue glowing icon, one of many "power-ups" that players can stumble upon in the environment. Ascending a hill, we see a battle in a ravine 30-feet below, with rebel troopers in shields (just like the droideka's) making short work of Imperial ground troops. The Imperial laser blasts ripple helplessly against the glowing, blue energy bubbles. Further into the forest, our trooper spies an AT-AT a good 200 feet away. His squad is quick to sound off on the trouble they are racing towards. Again, laser blasts don't do much against this heavily armored vehicle, which oddly was not a part of the battle in Return of the Jedi, yet was clearly seen patrolling the radar dish prior to the fight. Perhaps we're seeing what happened to it here. Our rebel trooper dashes off to the walker's left, where a conveniently placed uplink station awaits. The walker is facing him, but our trooper stands his ground, and the player controlling him holds down a button on the controller to establish a connection with a satellite network. The process takes a good five to seven seconds, plenty of time for the walker to get off a shot, but it doesn't send any fire his way. When the uplink is established, our rebel trooper orders a bomber strike. Rather than running away to safety, the rebel soldier sprints to the left side of the walker, and then through its legs. As he cuts beneath it, the walker takes a step forward, its giant feet inches away from achieving a quick kill. The scale of the walker is impressive, every bit as looming as it was when Luke bravely runs beneath one in The Empire Strikes Back. The sound of the walker's joints is identical to that of the film. Seconds after the rebel trooper is free of the walker, he looks up to see two or three Y-Wings zip by overhead, delivering a direct hit to the walker, which explodes immediately. The detonation is noisy and dangerous, sending huge chunks of metal hurling toward our solider and others nearby. The AT-AT stands its ground for a few seconds while on fire, then its front two legs buckle, sending its head and the rest of the body to the ground. At this point, the player controlling the soldier changes the viewpoint from first-person to third, something players can freely do at any time during gameplay. The character model is nicely animated, his head apparently tracking potential enemy movement. This AT-AT surprisingly wasn't the end of the fight – it was just the last line of defense between the rebels and an Imperial bunker. Rebel troopers pour into this diminutive interior space haphazardly. The bunker is every bit as beautifully detailed as the forest, complete with a mouse droid scurrying in a panic on the floor. The troopers rush around a corner to a crossing where, a teammate is grabbed by an invisible hand, picked up off of the ground, and tossed into metal piping, his body slumping over dead. Before our solider turns his head, we heard a familiar breath drawn. A slow turn to the right reveals Darth Vader. His saber is glowing dangerously red, and he's just 10 feet away, looking menacing and ready to win this war by himself. Our soldier fires off a few laser shots, but Vader blocks them with ease. Vader draws near and the demo ends. 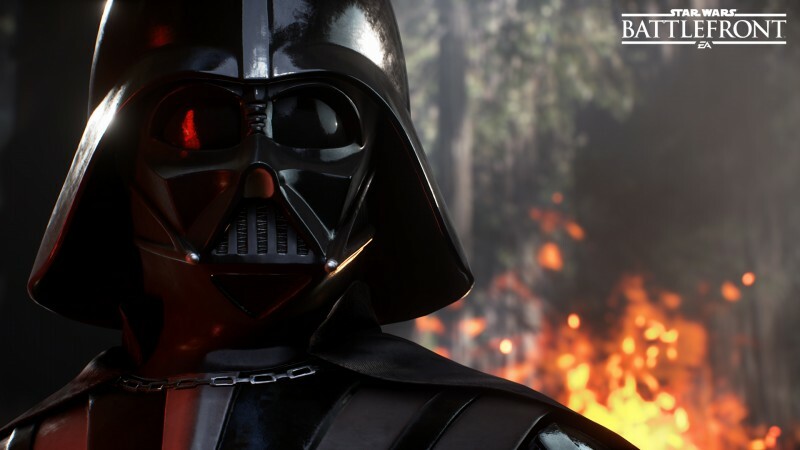 Nicklaus Fegraeus, DICE's designer director for Star Wars Battlefront, says players get the chance to suit up as villains like Lord Vader by obtaining power-ups scattered on the maps. He went on to say that these encounters play out like boss battles. The power-ups range from shields, the ability to pilot a walker, or other things. Fegraeus briefly talked about dogfighting in X-Wings and TIE Fighters and said that flight plays a large role in the game, but didn't go into specifics as to how these aerial conflicts unfold. The demo was heavily scripted and was not played live in front of us, but was an impressive first showing. For two years, DICE has stressed the desire to create an authentic Star Wars experience, and that's exactly what they delivered in this first demo. It had the look of a classic trilogy battle. Read on to learn about the game modes, the technology, and more. What we saw was a 40-player mode called Walker Assault, which we can only speculate will be used for other maps like Hoth and Tatooine. 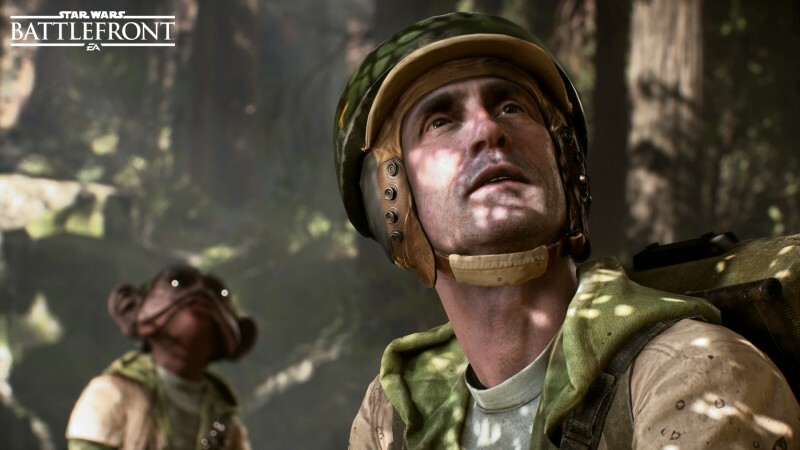 Fegraeus says that Battlefront is first and foremost a multiplayer game, but it also caters to people who don't want to play with others or be connected to the internet. While Fegraeus wouldn't go into multiplayer specifics, he did say that two players can play cooperatively through splitscreen, a feature we didn't expect to see.While playing online, two players who want to team up as much as possible can tap into a Partner feature, which allows them to share gear (an experienced player can bestow a newcomer with a high-tech load out during their play session), spawn at their teammates location after death, and be on the battlefield together as much as possible. The single player component of the game is called Battlefront Missions, and while few details were given, it sounds like it will be the same battles from the multiplayer experience with different missions layered in. The next part of DICE's presentation focused on the level of detail the team is bringing to the game, something the company discussed in an E3 teaser video last year. DICE spent a significant amount of time in LucasFilm's archives photographing props to achieve a high level of realism in the game. DICE used a proprietary photogrammetry system to bring the actual costumes and models to life in the game world. Some of the props shown were Boba Fett's mask, Darth Vader's entire costume, and an X-Wing. DICE showed off a few models from the game, too, including stormtroopers, Han Solo, and Admiral Akbar. 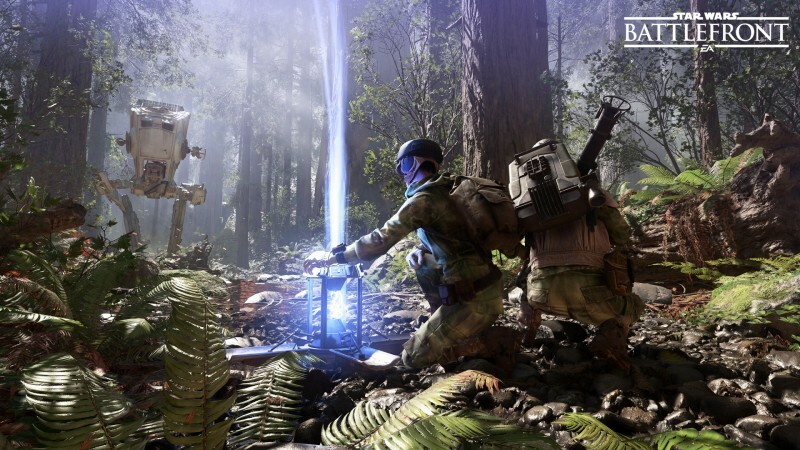 DICE has always excelled with audio in the Battlefield series, and it would appear Battlefront is setting another benchmark for the developer. 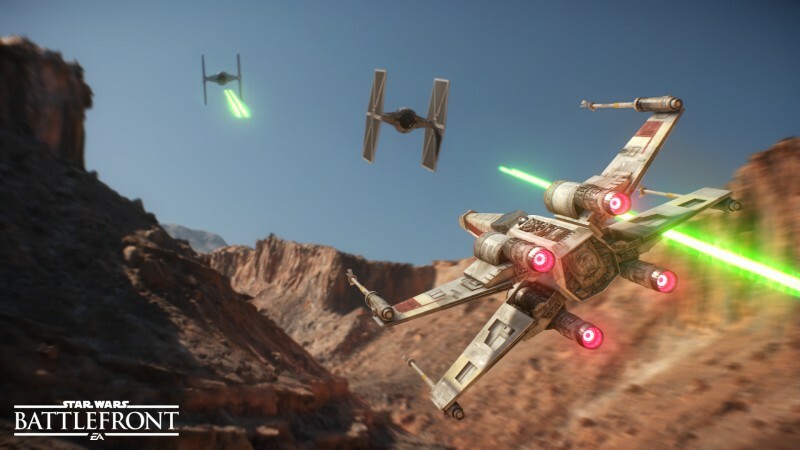 DICE is using Dolby Atmos to make the wars dynamic and thunderous for surround sound setups. Dolby Atmos was first used in Pixar's film Brave, and allows for up to 128 audio tracks to place sound precisely where it should be in relation to the player. 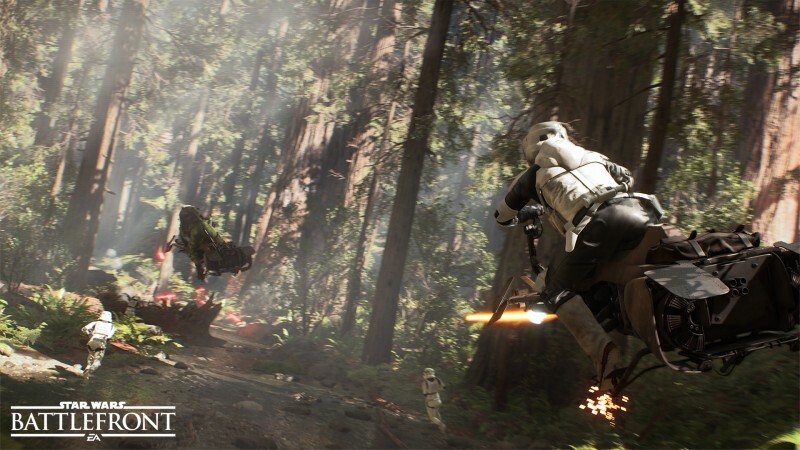 Next up was an early look at the official Star Wars Battlefront trailer (which you can watch here). Along with a small taste of the Battle of Endor demo I saw, this quick-moving teaser showcases a shot of the rebel encampment on Hoth, an aerial canyon battle on Tatooine, Boba Fett taking to the skies with his jet pack, a star destroyer hovering precariously over Endor's forest, and an amazing shot of a rebel soldier in a jet pack firing a rocket launcher shot at an AT-ST. The final shot is of a TIE Fighter factory on the Outer Rim planet Sullust. Not all of the battles are recreations of fights from the motion picture trilogy. One other thing to note: Not all of the rebel troopers in the Battle of Endor footage are human, implying perhaps that players can pick their race from the outset of play. Since Battlefront is shipping a month before Star Wars: The Force Awakens hits theaters, we won't see any of the wars from the film in the game at launch. That doesn't mean you won't see its locations. DICE is working closely with Lucasfilm and Disney to bring the Battle of Jakku to Battlefront as free DLC on December 8. If you pre-order the game, you get the DLC a week early on December 1. Jakku is the desert planet seen in both trailers. It's known as a junkyard planet. Interesting, the first shot of Jakku in the new movie trailer has ties to the game. "You see that crashed Star Destroyer and want to know what happened to it," says DICE's Sigurlina Ingvarsdottir, the senior producer of Star Wars: Battlefront. "The only way you find that out is by playing the DLC." The Interview and "No Comments"
After the demo concluded, I asked Ingvarsdottir as many questions as I could about Battlefront's gameplay and modes, but many of my inquiries were met with "no comment." While Ingvarsdottir revealed the max player count for online battles would be 40-players, and the minimum 8, depending on the modes, she wouldn't say if Walker Assault would exist on other planets. "What we saw today was Walker Assault on Endor," she said. "We're not prepared to talk about what we are putting on each of the planets." When I asked if the walker power-up would be something one player would get in a battle, Ingvarsdottir said she's "not prepared to go into specific features. As we said in the presentation, you get different power-ups, whether that's playing as a hero or acquiring an X-Wing or walker." I then asked Ingvarsdottir if DICE had any modes that were reflective of Free Radical's vision for its canceled Battlefront project, which would have allowed a battle to start on a planet's surface and transition to space combat. "In our game, we want to bring the fantasy of dogfighting to players," she said. "We bring you the X-Wing, and we bring you the TIE Fighter, and other air vehicles that you want to fly in and experience, but we keep them on the planet's surface." This means that dogfighting is contained within a planet's atmosphere. To clarify even further, you won't be able to run around on the ground, hop into an X-Wing, take flight, and soar off into outer space. There are no space battles in this Battlefront game. Yes, it's a bit odd for a Star Wars combat game to not have a map set in space, but as long as the vehicles move like we expect them too, it doesn't matter where the dogfighting unfolds. Electronic Arts' press release for Battlefront reveals the Millennium Falcon as one of the playable ships. I asked Ingvarsdottir if Vader could be played from first- or third-person, but she just grinned and said, "This is something we will go deeper into at a later time." Her smile continued through my next question about how players obtain gear and rank up. "You already know what I'm going to say," she said with a laugh. "We'll discuss that later." The demo DICE delivered is beautiful and true to the Star Wars experience that unfolds on the silver screen. The gunplay is immediately recognizable as Battlefield – quick, powerful, and heavily focused on team play. The gameplay flow, however, almost looked like a scripted, linear, single-player level. We'll have to see how it holds up when people take off in different directions through the forest. The demo covered plenty of real-estate on Endor, but it was difficult to make out how big the map actually was. The pacing appears to hold true to the Battlefront games of old, especially in the "boss" encounters against an AT-ST, AT-AT, and Darth Vader. I walked away from the demo wanting to get my hands on it. This was an impressive first look for a series that I honestly never thought would come back.